"Ever since I can remember, my Mother used to tell us where our grandparents and great-grandparents had come from. My grandfather, Isakas Landau, had arrived in Mexico in 1925 leaving his hometown, Kudirkos Naumiestis, behind," says Ronén Waisser Landau, Honorary Consul of Lithuania in Mexico. 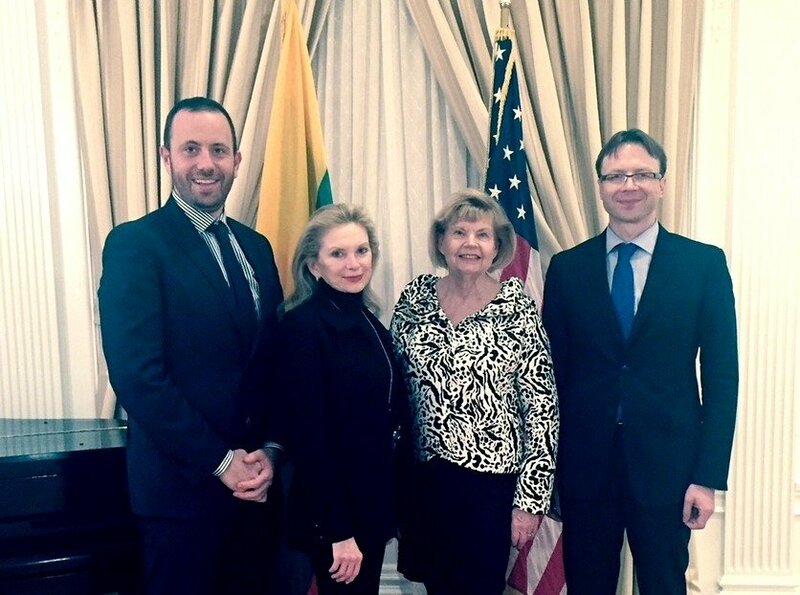 Honorary Consul Ronén Waisser Landau with Krista Bard (Hon Con in Philadelphia, PA), Ingrida Bublys (Hon Con in Ohio) and Rolandas Kriščiūnas, Ambassador of Lithuania to the United States of America and Mexico. "Three more of his brothers, Jokubas, Kalmanas and Samuelis, had arrived to Mexico and in 1933 his parents (my great-grandparents followed their children). "Since I was a child, I had an interest in knowing my own personal history and asked as much as I could about Lithuania and my grandfather." 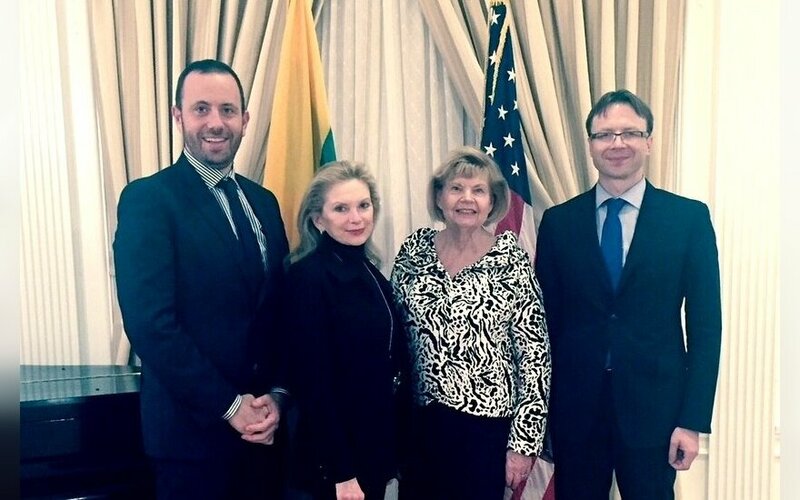 How did you become an Honorary Consul of Lithuania? In 2004, while living in Washington DC, I approached the Embassy to inquire about the possibility of re-instating my Lithuanian citizenship. Immediately, the diplomats posted there including the Ambassador showed interest in my history. I guess they had never met a Mexican National with Lithuanian roots. I was granted citizenship approximately one year after. Since my very first visit to the Embassy I started helping the staff with issues that brought together Lithuania and Mexico. They were happy to learn about Mexican politics, Mexicans with Lithuanian roots and other matters. When I returned to Mexico I became close to the now deceased Dr Dominique Verut, who served as Honorary Consul for at least 25 years. I also stayed in touch with the Embassy Staff and visited the Embassy every time work took me to Washington. By 2008 Dr Verut had announced that he wanted to leave his position as the Consul and I became a natural candidate for the position. I was honoured to be appointed as the Honorary Consul of Lithuania in the Summer of 2009. What is your favourite thing about Lithuania? How would you describe your country's relationship with Lithuania? The relationship is very good. There are still, however, great areas of opportunity. What is the difference between an Honorary Consul and an Embassy Consul? Generally embassies have full-time staff who divide portfolios according to their positions and backgrounds. When you are an Honorary Consul you have to learn about and act on every matter that is needed: Consular protection, enhancing the countries’ relationships, preparing official visits, following up on whatever matters the Ambassador or Home Office require you to. This is not your full time occupation, but could you describe the schedule of an honorary consul of Lithuania? Is it hard work? It’s a pleasure. But it does take a lot of effort and time. We must be alert for the needs of our citizens 24/7 especially for those who get in trouble while visiting Mexico - for example, when they get detained, lose their passports or any other issues. How do you keep informed about the main events in Lithuania? We follow as many news outlets as possible, both official and unofficial. Since neither I nor my assistants speak fluent Lithuanian we rely mostly on outlets published in English. Travel, reading and learning about International Relations and Politics, exploring by foot or by bicycle what Mexico City’s streets have to offer. If you could describe Lithuania in one word, what would it be? Ronén Waisser Landau started his career working for the Mexican Federal Anti-Corruption Ministry and then moved on to consulting on international development issues in Washington DC. While in DC he applied for and was granted Lithuanian citizenship. Upon his return to Mexico he started several joint ventures for high end housing projects in Mexico City. Soon after he founded EuroPasaporte America, a firm dedicated to obtaining European citizenship for the descendants of European émigrés. The Lithuania Tribune talks to Vitaliy B. Antonov, Honorary Consul of Lithuania in Lviv, Ukraine .